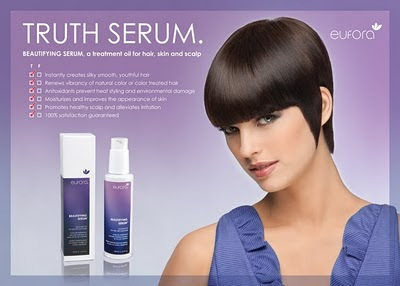 I am sitting here looking at this ad for Eufora, and thinking...wouldn't we all LOVE a little truth serum!? How simple life would be, if we had truth serum..Or would it?! Although Eufora can offer a lot, truth serum is not one of the things it can really give you. BEAUTIFYING SERUM, now that, they can give you!! ~a treatment oil for hair, skin and scalp. ~ is a fast absorbing, light weight oil blend that immediately improves the health and appearance of hair, skin and scalp. Enjoy the moisturizing, conditioning and antioxidant benefits of kukui, neem, argan and cranberry oils. Hair: Beautifying SerumTM instantly changes the texture of hair leaving it feeling silky smooth. Locks-in moisture without adding weight, creating beautiful shine and vibrant color while improving the appearance of split ends. Consistent use improves the overall health of the hair. Skin: Improves skin's appearance and alleviates irritations caused by skin conditions. Vitamins, minerals and other nutrients penetrate deeply and absorb quickly to relieve dry, itchy skin. Prevents moisture loss and leaves skin feeling soft and silky while protecting from harsh environmental stressors. Scalp: Moisturizes and soothes dry, itchy scalp while working to unclog pores, remove excess sebum and stimulate increased blood circulation to the scalp. Beautifying Serum helps create the ideal environment for strong, healthy hair growth. Stay tuned for a proper review, until then, stop into Bijou and buy some for yourself, you know that as always any product that you do not like, you can bring it back, we stand behind out products 100%.